Hybrid cars are now more popular than conventional cars due to lower lifetime operating cost and environmental impact. Hybrid car uses a combination of an electric motor and a traditional engine to power the vehicle. 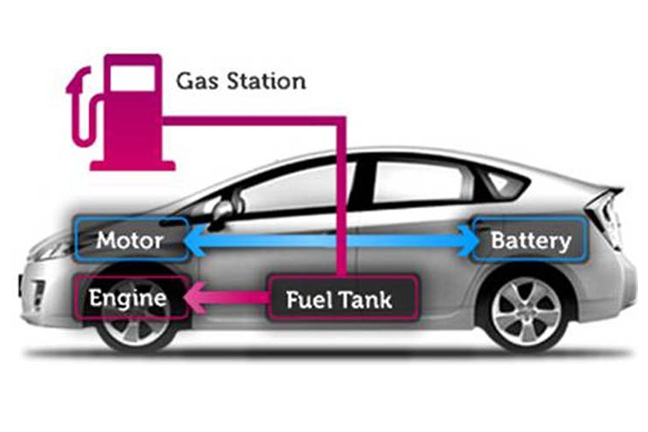 This means the car uses a combination of electricity stored in batteries and fuel stored in a tank to drive the car forward. HEVs are often more expensive than similar conventional vehicles, though some cost may be recovered through fuel savings or state incentives. A wide variety of HEV models is currently available, popular classes are Full Hybrid, Plug-In Hybridand Electric Vehicles. Full hybrid vehicles are using a battery and electric motor in addition to an engine that runs on gasoline. These types of cars are also more efficient and they can automatically choose to operate in electric mode, or engine mode. The example of a full hybrid is the Toyota Prius but today many automakers now offer full hybrids. Plug-in hybrid vehicles (PHVs) have both an internal combustion engine and electric motor. These vehicles are powered by gasoline (petrol/octane), and a battery, which is charged up with electricity by plugging into an electrical outlet or charging station. Electric vehicles (EVs) also called battery electric vehicles are propelled by an electric motor powered by rechargeable battery packs. No other fuel source is used, and there is no internal combustion engine. Here are few of the drawbacks of a hybrid car:-hybrid cars are often less power than gasoline powered engine and more suited for city driving and not for speed and acceleration. Hybrid cars are comparatively expensive than a regular petrol car but that extra amount can be offset with lower running cost. Weight of hybrid car is higher due to a gasoline powered engine, a lighter electric motor and a pack of powerful batteries. The presence of dual engine, continuous improvement in technology led to higher maintenance cost and difficult to get good mechanics to repair the car. In case of an accident, the high voltage present inside the batteries can prove lethal for passenger. When you start up a hybrid vehicle, you may not even realize it! The engine is so quiet that you can hardly hear it. This is true even when you are driving down the road. The unique engine and power supplies are the cause of this silence, even you can’t see out of the cars and nobody hears you are coming. Mainstream manufacturers are rushing to market hybrid and new electric cars because of growing market demand. Volvo announced that all of its new cars will have a battery and electric motor by 2019. Mercedes, Audi, Toyota and Volkswagen are hot on the electric cars trail as well. Countries that have made early progress in the sale of electric cars, such as Norway, France, the Netherlands, and the UK, are expected to be among the leaders in 2040. Bloomberg New Energy Finance’s says by 2040 54 per cent of new car sales and 33 per cent of the global car fleet will be EVs. China, the U.S. and Europe make up over 60 per cent of the global EV market in 2040. Lithium-ion battery demand from EVs will grow 6090 per cent by GWhduring 2016 to 2030. Fossil fuel demand will be displaced by the growing fleet of EVs. It projects 34 per cent of cars on the road will be EVs by 2040 – 530 million EVs in total – which will displace up to 1272m Liters of transportation fuel per day. As per ExxonMobil 2040 Outlook for Energy, Hybrid Electric vehicles (HEVs) will reduce 40 per cent of global light-duty vehicle sales in 2040 compared to about 3 per cent in 2016. Bangladesh HEVs market: Emerging economies such as India, Bangladesh are not expected to see significant EV sales until late in the next decade, despite that country’s pledge that all new cars sold there will be electric by 2030. EVs and PEVs cars will not be economical for us due to insufficient infrastructure, dusty environment, huge traffic and lack of electricity. In Bangladesh demand for full hybrid cars (FHC) are growing significantly considering fuel efficiency. As an environmental aspect a hybrid car produces 25 to 35 per cent less CO2 than regular cars. The writer has more than 10 years of experience on petroleum down steam, vehicles, general manufacturing and process industry.